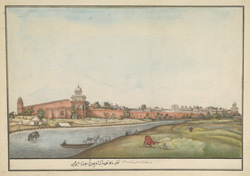 Drawing of a view of the Red Fort in Delhi, seen across the Jumna river. An elephant, cattle and an Indian carriage are shown in the foreground. Inscribed on the front in Persian characters: 'Naqshah i rukar i qil'ah i mubarak i Shahjahanabad ba-taraf i darya i Jamuna' (Picture of the view of the blessed fort of Delhi on the side of the river Jumna). The Red Fort or Lal Qila, was constructed by Shah Jahan (r.1627-58) for his new city of Shahjahanabad. The Lahore gate was one of the main entrances to the fort and is composed of a central arch or 'pishtaq' with side towers. The octogonal-shaped fort complex is surrounded by high fortification walls of red sandstone which reach between 18-33 m in height. Key buildings inside the fort include the Diwan-i-Am (Hall of Public Audience), the Diwan-i-Khas (Hall of Private Audience), Moti Masjid, and the Khas Mahal (private chambers of the emperor).